1.Eldad TZAHOR,Gabriele Matteo D'UVA,et al. 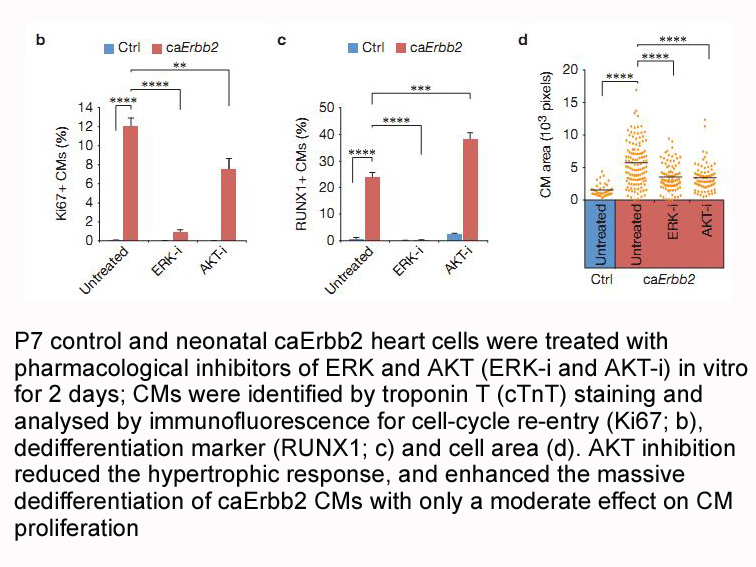 "Methods, kits and devices for promoting cardiac regeneration." US Patent App. 15 ,2016. Description AKT inhibitor VIII is a potent and selective allosteric inhibitor of Akt kinase with IC50 values of 58 nM, 210 nM and 2119 nM, for Akt1, Akt2 and Akt3, respectively . The solubility of this compound in DMSO is >9.2 mg/mL. General tips for obtaining a higher concentration: Please warm the tube at 37℃ for 10 minutes and/or shake it in the ultrasonic bath for a while. Stock solution can be stored below -20℃ for several months. AKT inhibitor VIII significantly inhibited the proliferation and increased the LDH release in both cell lines in a dose-dependent manner. AKT inhibitor VIII dose-dependently induced cell cycle arrest at the G0/G1 phase. The protein expressions of p-cyclin D1, total cyclin D1, p-CDK2, total CDK2, pRb, total Rb, Bcl-xL, and Akt were significantly inhibited by AKT inhibitor VIII, whereas the protein expressions of Bad and Bax, and the proteolytic cleavage of caspase-9, caspase-7, and polyADP-ribose polymerase (PARP) were dramatically increased. AKT inhibitor VIII dose-dependently suppressed the tumor growth in vivo, achieving 32% and 54% inhibition rates after intraperitoneal injection of 15 mg/kg and 30 mg/kg, respectively. 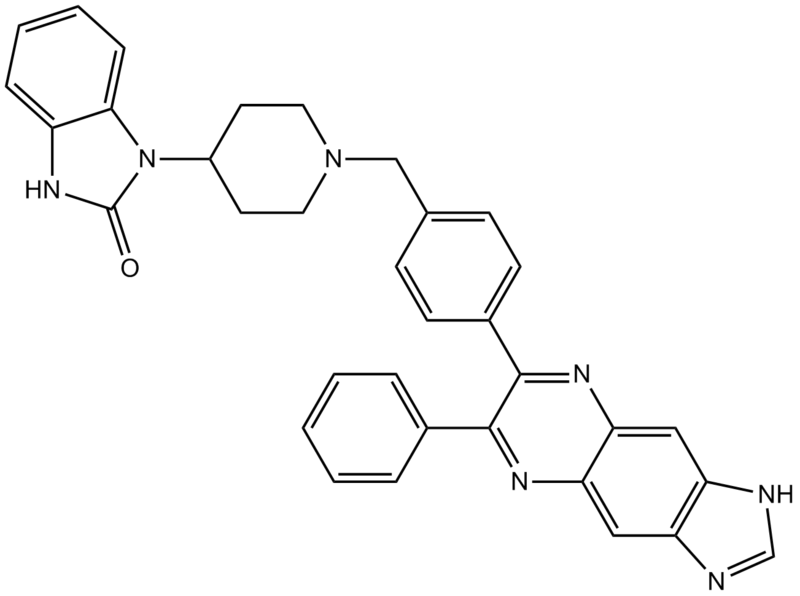 Zhong Z, Dang Y, Yuan X, Guo W, Li Y, Tan W, Cui J, Lu J, Zhang Q, Chen X, Wang Y. Furanodiene, a natural product, inhibits breast cancer growth both in vitro and in vivo. Cell Physiol Biochem. 2012;30(3):778-90. 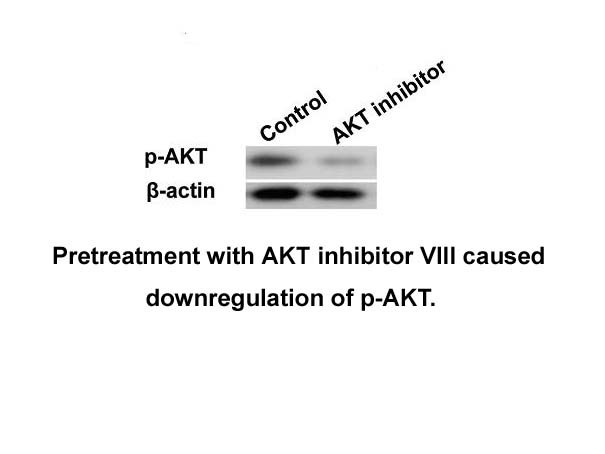 AKT inhibitor VIII is a cell-permeable, reversible and potent, selective inhibitor of Akt1, Akt2 and Akt3 with IC50 values of 58 nM, 210 nM and 2.12 μM, respectively. AKT inhibitor VIII has shown to remarkably increase anti-proliferation induced by furanodiene in human breast cancer cell MCF-7. AKT inhibitor VIII could enhance the furanodiene- stimulated Akt and p-Akt expression decreases as well as increase furanodiene-induced PARP cleavage in MCF-7 cells . AKT inhibitor VIII has been revealed to inhibit IGF-1-induced Akt phosphorylation in a concentration-dependent manner. AKT inhibitor VIII has also been demonstrated to reduce PRAS40 phosphorylation in PC12 cells . Zhong Z1, Dang Y, Yuan X, Guo W, Li Y, Tan W, Cui J, Lu J, Zhang Q, Chen X, Wang Y. Furanodiene, a natural product, inhibits breast cancer growth both in vitro and in vivo. Cell Physiol Biochem. 2012;30(3):778-90. Wang H1, Zhang Q, Zhang L, Little PJ, Xie X, Meng Q, Ren Y, Zhou L, Gao G, Quirion R, Zheng W. Insulin-like growth factor-1 induces the phosphorylation of PRAS40 via the PI3K/Akt signaling pathway in PC12 cells. Neurosci Lett. 2012 May 10;516(1):105-9.